Wedding PR: Southern Living, Travel Pulse, and more! We are so delighted to share the latest roundup of client features including Southern Living, Travel Pulse and more! See it all below. 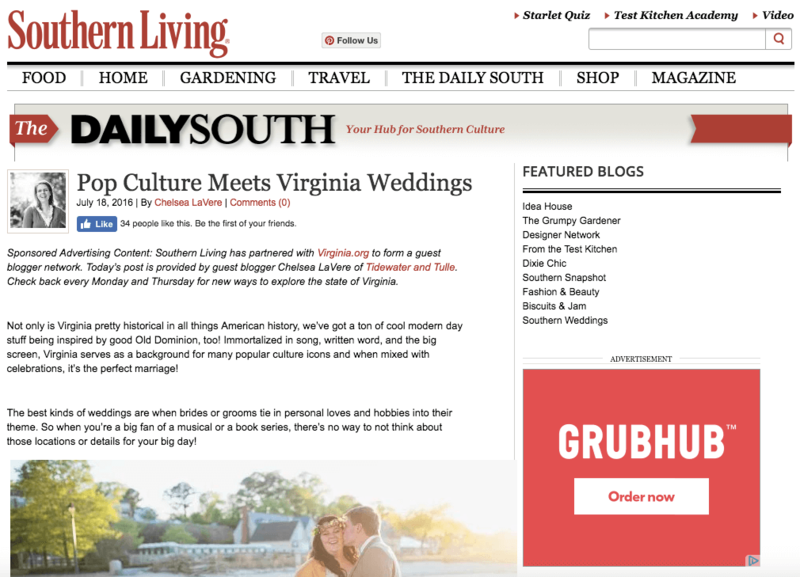 Don Mears Photography was featured on Southern Living in the article Pop Culture Meets Virginia Weddings. See the full article here. Azazie was featured in the Huffington Post article Celeb Bridal Looks – For Less! See the full feature here. Stephanie Yonce Photography was featured on Hill City Bride with a free-spirited wedding. See the full feature here. Taylor’d Events was featured on WeddingWire EDU with her guest article Starting Your Morning Off on the Right Foot. See the full article here. 100 Candles, Fantasy Sound, Cocoon Events, and Don Mears Photography were featured in the Huffington Post article The Wedding Lighting Trends You Need to Know. See the full article here. Don Mears Photography was featured on The Big Fat Indian Wedding in the roundup 31 Chic Garden Wedding Ideas. Se the full feature here. Destination Weddings and Mike B Photography were featured in the Huffington Post article What’s ‘In’ for This Year’s Destination Weddings. See the full article here. 100 Candles was featured in Catersource in their guest article Candle Inspiration That Will Take your Events to the Next Level. See the full feature here. Destination Weddings was featured on Travel Daily News in the article Destination Wedding Report Details 2016 Trends and Statistics. See the full article here. Destination Weddings was featured on Travel Pulse in the article Report Breaks Down Destination Wedding Trends for 2016. See the full article here.